Security for human rights defenders is often framed in rather narrow terms, such as protection from violent attacks, office raids, judicial harassment or threats from armed groups. Yet, this overlooks many varied and subtle ways in which we can be vulnerable and resilient, as well as important steps we can take to sustain ourselves and our work. 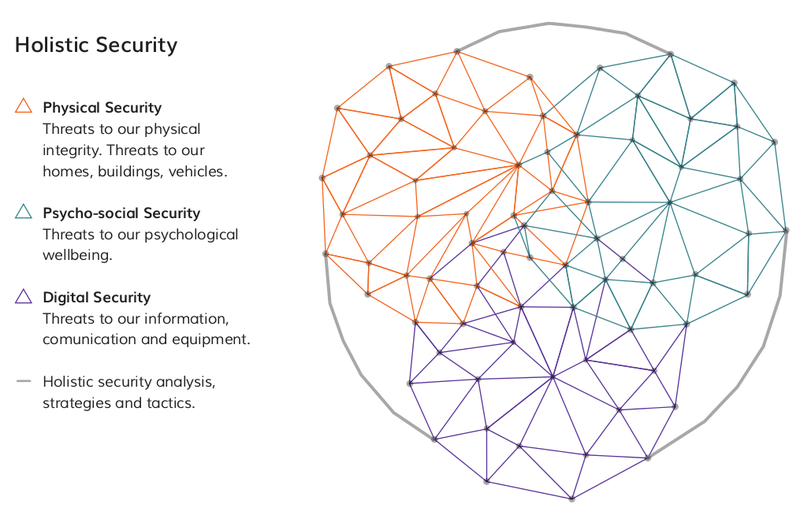 In this section we will explore the concepts of well-being, diverse security strategies, and managing our digital information as being fundamental to a 'holistic' approach. The holistic approach frames security for human rights defenders as well-being in action: being physically and emotionally healthy and sustaining ourselves while continuing to do the work that we believe in. In order to protect ourselves from the threats to our well-being posed by stress, fatigue, trauma, and grief (among other things) we have to engage consciously and deliberately with the idea of self-care. Self-care should not be understood not a selfish act, but rather as a subversive and political act of self-preservation. How we define our well-being in the context of activism is subjective and deeply personal. It is influenced by the differing needs of our bodies and minds, the challenges we face, our beliefs (religious, spiritual or secular), our gender identities, interests and relationships. As activists and human rights defenders, we must define security for ourselves and build solidarity and support for one another into our groups, organisations and movements on this basis. This step is fundamental to our later processes of analysis and strategising to defend and expand our space for positive action in promotion and defence of human rights. We can view attacks against human rights defenders as attempts by our adversaries – those who don't share our aims or actively oppose them – to close the socio-political space in which we work. This space can include literal physical spaces, as well as economic, social, technological, legal or environmental space, among others. 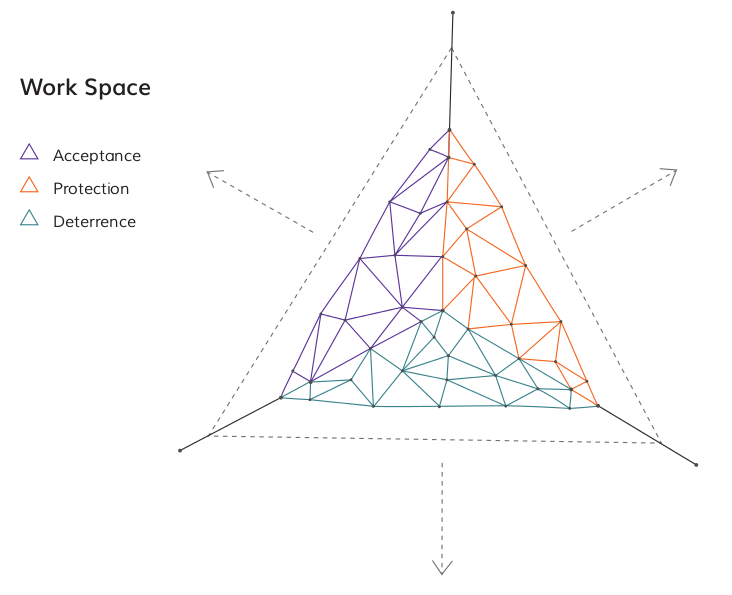 Adopting an organised approach to security means defending our space for work and, ideally, expanding it. To achieve this we can implement strategies which either encourage others to accept our work; deter attacks against us, or with which we can protect ourselves. Throughout this guide we will look at tools and tactics which can help us implement these strategies. An organised holistic approach to security requires an organised approach to information and data management. Protecting our sensitive data - the files we manage, our email and mobile phone communication, etc. – is now more important than ever. On account of the increasing use of digital technologies in human rights activities, our adversaries and the threats they pose have adapted to this new environment too. We must deliberately identify our sensitive data and protect it, not only as a security measure, but also as an act of political self-empowerment. So let’s think of holistic security practice as conserving the well-being and agency of human rights defenders, their families and communities through the consistent use of tools and tactics for psycho-social, physical and digital well-being and security in ways that support and reinforce each other. Referring to holistic security as 'well-being in action', means thinking about our safety as a source of empowerment. We should remember that the threats and challenges we face as human rights defenders are always changing. In our work, 'unexpected' events are the norm and no single security plan will work in every situation. We need to expect the unexpected and stay ‘present’, engaged and centred to hone our ability to cope. Accepting that we can't make ourselves completely 'safe' in every situation we also need to build our own resilience and agility. In this sense, resilience is the ability to recover quickly from set-backs or injuries; agility is the ability to quickly adopt new security practices in response to new or emerging threats. The goal therefore, is not to cease our activities in order to be safe, but to mitigate and reduce that threats we face, to protect ourselves and our communities as we carry out our work. For most human rights defenders, the notions of resilience and agility are not new, nor is the idea of having tools and tactics for staying safe during dangerous work. Before developing new approaches to our security it is worth exploring some of the existing practices we have by completing the following exercise.